Only a company like Red Bull could pull together the resources to rent the largest airport in the world to stage the world’s ultimate drag race. Seeing as how this yet-to-open airport is in Istanbul, Red Bull called up seven of the fastest vehicles and pilots – including fighter pilots – Turkey has to offer to go head-to-head in this exhibition of speed. The contenders include Red Bull’s own Formula 1 car, the RB8, piloted by test driver Jake Dennis (admittedly not Turkish), an F-16 fighter jet piloted by Erhan Gunar and Serdar Dogan, a Tesla P100D electric race car (switched to Ludicrous mode, of course) driven by Emma Kimilainen, a Bombardier Challenger 605 piloted by Timur Ozkan and Ibrahim Kurtulus, a Lotus Evora GT 410 driven by Toprak Razgatlioglu, an Aston Martin Vantage driven by Yagiz Avci, and finally, a Kawasaki H2R piloted by recently retired multi-time World Supersport champion, Kenan Sofuoğlu. 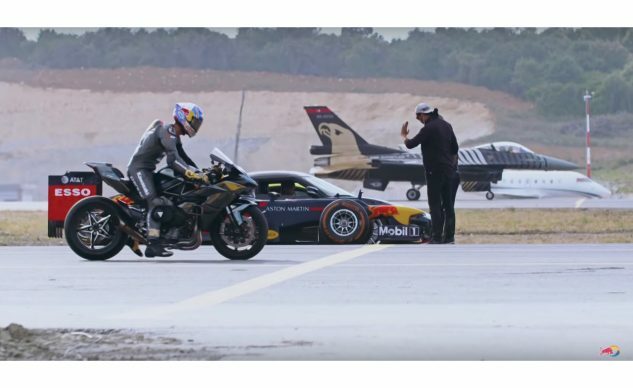 We’ve seen car vs. bike drag races plenty of times already, but it’s rare to see an actual Formula 1 car used in a drag race – and it’s even less common to see an F-16 take to the line, too. The contestants only used a quarter-mile of the airport runway to do their race, but maybe that’s for the better, as we know the two planes would ultimately destroy the cars and motorcycle if given more space to take off and fly at full speed. Nonetheless, the race itself is entertaining and revealing in a few ways. For one, we get to see how fast a Formula 1 car covers the quarter-mile. Even more interesting is the speed at which the F-16 covers the distance with its wheels still on the ground. Then there’s the H2R. It’s no surprise to see it get the jump off the line, but the RB8 and F-16 make up a significant amount of ground by the halfway mark. Who ultimately ends up taking the win? Take a look at the video below to see for yourself.